(CNN) -- Sandy Lyle apologized for disrupting Colin Montgomerie's British Open preparations on Tuesday, but did not retract his allegations of cheating against his fellow Scot. 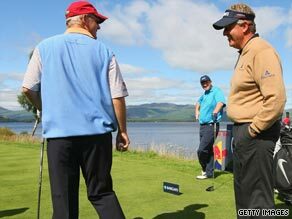 Sandy Lyle, left, chats to Colin Montgomerie during the Pro-Am prior to last week's Scottish Open. Lyle angered his friend, who he lost out to in a bid to become Europe's 2010 Ryder Cup captain, when last week he brought up an incident involving Montgomerie at the 2005 Indonesian Open. Montgomerie was accused of taking an incorrect drop in a bunker after a rain delay, and gave his prize money to charity despite being cleared by the tournament committee. Lyle made his comments when asked if his decision to walk off after 10 holes of last year's British Open had cost him the Ryder Cup captaincy. "In my frustration over continually being asked about the incident at last year's Open Championship I regretfully brought up another old incident, one that has long since been resolved," he told a packed press conference at Turnberry. "I was trying to make the point by comparison that neither of these incidents had anything to do with the selection of the current Ryder Cup captain. "I deeply regret making this comparison and apologize to Colin for involving him in my own issue. I sincerely hope that nothing more will be made of this issue. I hope our friendship is still there." However, Lyle insisted that Montgomerie was still guilty of breaking the rules in Jakarta. "It's all been well documented. It's all on video. It's not like I'm pre-fabricating this," the 51-year-old said. "The drop wasn't close to where it should be. And of course on TV it doesn't lie." Lyle had hoped to talk with Montgomerie at Turnberry on Tuesday, but the UK Press Association reported that the 46-year-old walked straight past him on the way to the first tee. "It's a rather strange apology to be honest with you," Montgomerie told PA before going out to practice. "It's nothing much to do with me at all -- it's all Sandy. I've read it and I'm digesting it and I'll let you know when I've digested it further. "I've nothing much to say. I'm just trying to come down here and compete in the Open and my preparations have been slightly dented. I'm not very happy about that at all."